Solomon also drew attention to shifting African demographics. “52 cities in Africa have a population of over a million people,” Solomon said. “And by 2035 the labor force in Africa could be as big as China or India.” Calling for long-term research development, innovation and investment in skills development, Solomon cited IBM’s efforts to expand its presence from 4 countries to 24 countries in Africa in the past decade alone while also building the first commercial research and development lab in Africa. Bringing entrepreneurs and local partners together to work with IBM Solomon notes that efforts range from working on cutting-edge nanotechnology to creating plant innovation centers across the continent. Geneva-based Under Secretary for the UN International Strategy for Disaster Risk, Margareta Wahlstrom, highlighted disaster risk reduction, post 2015 sustainable development goals and the climate change agenda as three key global issues to contend with. Wahlstrom emphasized focusing on data and interdisciplinary as well as multi-stake holder research as the most critical calls for action. 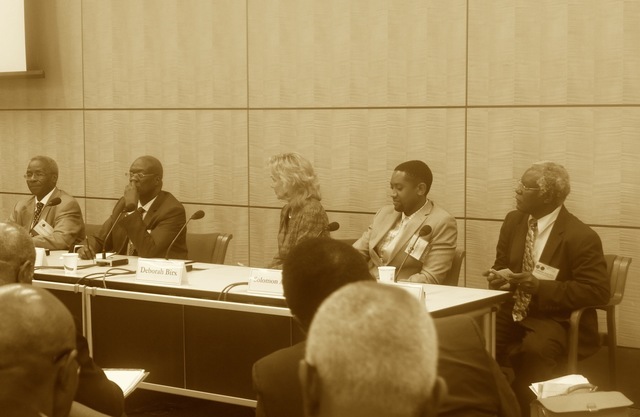 Panelist Wole Soboyejo, President of Africa University of Science & Technology shared how the US/Africa Materials Institute was launched at Princeton in collaboration with the National Science Foundation. Soboyejo traveled to over 35 African countries in an effort to establish collaborations between universities in the United States and those in Africa. “Our vision is to be a meritocracy..to replace brain drain with brain circulation, work towards transparency in governance, and build links across the world to diffuse innovation across Africa,” he stated. Farid Fezoua, CEO & President of GE Healthcare Africa noted how Africa is a young continent in the sense that 60% of the current population is under the age of 20. He noted that General Electric’s first overseas branch was established in South Africa, and GE remains a key stakeholder in encouraging innovation in Africa. Fezoua gave several examples of what he called ‘reverse innovation’ developed in Africa including the creation of solar-powered surgery kits, and hand-held ultrasounds. Ambassador & Global AIDS Coordinator at the US Department of State, Deborah Birx, highlighted progress in several African countries including Malawi whose HIV/AIDS prevention programs were effective and successfully scaled up at the national level. However, she urged more efforts need to be made to reduce the rates of infection, especially among young women who make up the largest proportion of affected populations.